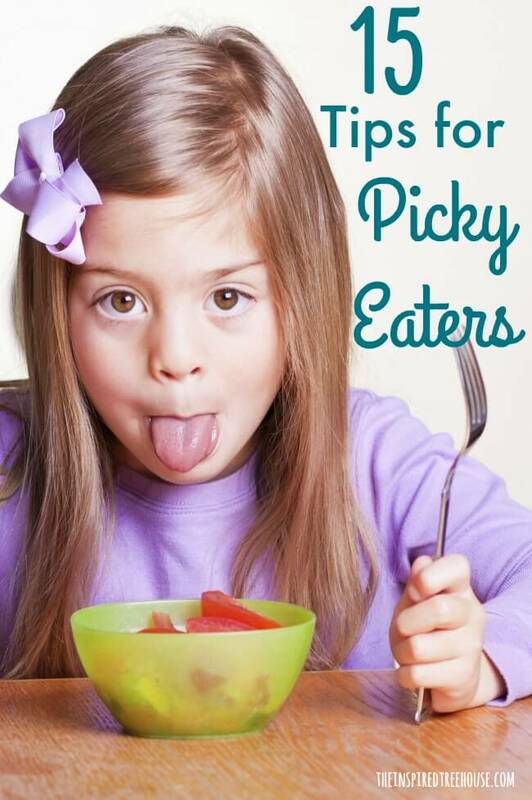 Do you know kids who are picky eaters? You’ve come to the right place! 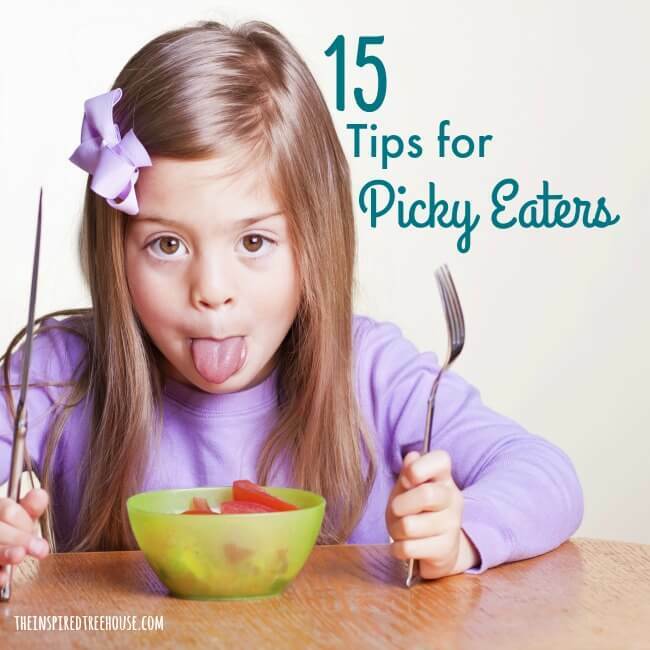 Here are some of our favorite tips for conquering picky eating! This post contains affiliate links. Read more. 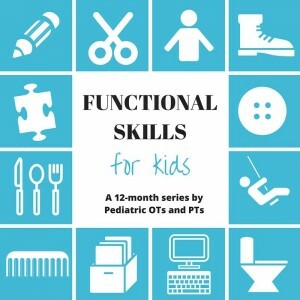 This post is part of a year-long series with 9 other awesome pediatric therapy bloggers about the Functional Skills of Childhood! Last month, we took a closer look at sensory strategies for sleep. Be sure to check out what our other therapist friends had to say about all of the skills involved in personal care! 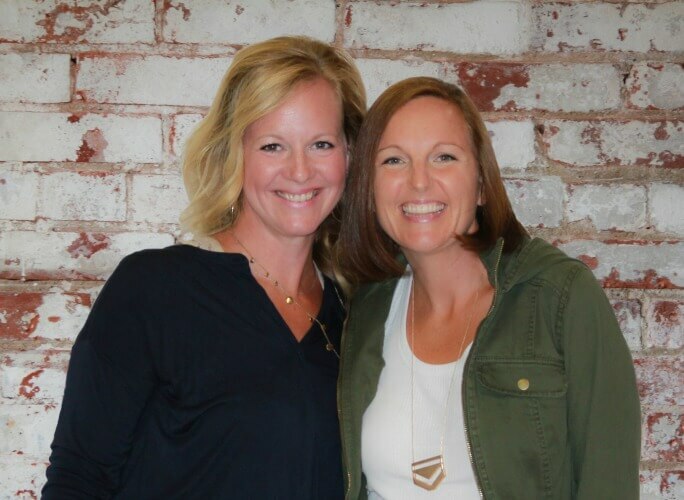 This summer, I spent 3 days with two of my favorite therapy friends at the Ohio Institute for OT/PT School Based Practice, where we go every year for continuing education to maintain our therapy licenses. Being a PT, I typically sign up for the courses about adapting wheelchairs or methods for evaluating and treating the child with cerebral palsy. But this year, it was a different type of course that grabbed my attention. It was called How to Get Kids to Eat. Not your typical continuing education course for a PT, right? But perfect for me, because I have a very picky eater at home. You know, the kind of kid who won’t touch a vegetable or a piece of fruit or yogurt or even juice. She won’t eat anything she doesn’t recognize and won’t touch anything that doesn’t resemble bread, pasta, or chips. I learned so much during the course I took over the summer (and from my own reading and research) and I know that there are many picky little eaters out there, so I thought I would share some of the information with our readers here at The Inspired Treehouse. Of course, I will only be able to scratch the surface of the issue, but the main point I’ve taken away is that the all of our sensory systems play a role in eating. Picky eating is a natural part of child development. It is quite normal for a 2 year old to absolutely refuse to eat anything green, anything with skin, or anything mushy. The question becomes: What are you going to do about it? 1 — Write a Social Story — Talk frequently about where you will eat, what you will eat, where the food you eat might have come from, what awesome changes happen in your body when you eat well. For example: Tonight we’re having dinner at grandma’s house! Grandma is making stir fry. You can even try eating your stir fry with chopsticks! There will be some broccoli on your plate. Broccoli has vitamins in it that can make your bones strong and keep your body healthy! 3 — Look at Positioning — Does your child have good supported posture so that she can focus on eating instead of holding herself upright? This is especially important for any child with developmental delays. Are her feet supported on the floor or on a bench so that her knees are at a 90 degree angle? Is the table at the right height so that her arms can rest comfortably without having to reach way up high? Does she have adequate support at her trunk and back to keep her from feeling like she will fall out of the chair? 4 — Play With Your Food! — Make an effort to play with food that your child may be resistant to. Being able to touch an unfamiliar or undesirable food is a big step in the right direction when the ultimate goal is to get that food into a child’s mouth. Try one of these great products for picky eaters! Blow pieces of popcorn or roll peas across the table, build with pretzel sticks (Jenga-style! ), etc. You can also play games like What’s in Ned’s Head? using real food. Make a mystery box for your child to reach into and feel different foods. Can he guess what he is feeling? Can he describe it? 5 — Practice smelling foods — The sense of smell helps to create the flavors that we taste in food. This is the reason that when we have a cold, nothing tastes quite right. Keep in mind that when you heat foods, they smell stronger! If your child is sensitive to smells, serve food at room temperature. 6 — Cook With Your Kid — Getting in the kitchen with your kiddo is the perfect way to provide interesting, playful experiences with food (and it’s a great way to spend some time together too!). Check out some of the sites listed below. 7 — Warm Up the Senses — Since eating is a full body sensory experience, try warming up before mealtimes with some oral sensory, olfactory, or tactile play! 8 — Take Baby Steps — Start by encouraging your child to tolerate a non-desired food on her plate for a certain amount of time, not necessarily in her mouth. Set a timer if necessary. Can she try touching the food with her finger? Smelling it? What about touching it to her lips? 9 — The Two-Container Trick — Say your child hates peas but loves macaroni and cheese. Try sending her to school with two small containers of that mac and cheese. In one container, mix a tiny sample of peas into that yummy, cheesy pasta. Your child may choose not to eat that container because it has peas in it. OR they may be soooo hungry, that they want to eat both containers, in the process realizing that those peas aren’t so bad after all! This adds another element of control for your child. 10 — Know When to Say When — Make sure to establish a clear way for your child to request to be finished with the meal. This could be as simple as a verbal request — “I am done”. Or, it could be a gesture or sign (e.g. setting his fork down beside his plate, using sign language, or shaking his head “no”). Whatever you and your child determine the signal to be, respect it — even if you don’t feel as if he has had enough. 11 — Watch and Learn — Try eating with your child in front of a mirror — children are visual learners. You can also show videos of other children eating or cooking different types of foods. 12 — Pay Attention to Body Language — If a child is leaning away, has his hands up in front of his face, or is turning his head away from a food, respect the message that he is sending! 13 — Limit Visual and Auditory Distractions — This means turning off the TV, putting cell phones away, and maybe even moving away from a family-style dinner table with lots of food presented at once. Think about using lower lighting. Playing slow tempo music that matches breathing and heart rhythms (60 bpm) can also promote relaxation. 14 — Move It! 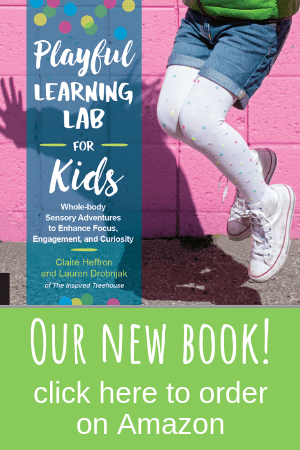 — If the child just can’t seem to sit still for mealtime (rocking, bouncing, tipping back in the chair– try some vestibular activities before meals. Input like this can last up to 4-6 hours and can be done way ahead of a busy mealtime. 15 — Know How the Body Works — Think about the body awareness, coordination, and motor planning it takes to get your hand to your mouth! Kids have to be able to grade their movements, using appropriate force and timing to be able to feed themselves. You may take this for granted, but for little ones, it can be tricky! Check out the cups and utensils your child uses. How heavy or light are they, and how does this affect the way they eat? Kids are smart! Provide them with the tools they need to feel comfortable, in control and empowered and they may just surprise you! Remember that eating is a full body sensory motor experience and that feeding difficulties can be complex. *If your child is demonstrating such a limited diet or such extreme unwillingness to try new foods, it may be time to get some help. If you’ve tried the strategies above, or if you are seriously concerned about your child’s nutrition and weight, always trust your instincts and talk to your pediatrician. Mealtime Notions – Provides consultation, training, and resources for families and professionals working with children who have special needs and mealtime challenges. Check out their Get Permission Video. SOS Approach to Feeding – Dr. Kay Toomey is a pediatric psychologist who has worked for over 20 years with children who don’t eat. She developed the highly effective, family-centered SOS Approach to Feeding to assess and successfully treat children with feeding problems worldwide. New Visions – Provides continuing education and therapy services to professionals and parents working with infants and children with feeding, swallowing, oral-motor, and pre-speech problems. Choosemyplate.org – Provides practical information to individuals, health professionals, nutrition educators, and the food industry to help consumers build healthier diets with resources and tools for dietary assessment, nutrition education, and other user-friendly nutrition information. 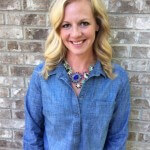 Your Kids Table – Alisha Grogan is a mom and pediatric occupational therapist who started her blog to share the knowledge she has about feeding kids and sensory play (both specialties of an occupational therapist). You’ll find tons of great resources at Your Kids Table! Cooking With My Kid – Preparing food together and serving it creatively makes all the difference. Kids can and do enjoy new foods when they are a part of a process. Playful Pantry – More than just providing recipes for parents who want simple, clean, uncomplicated food, Jennifer Carden creates ingenious recipes that help families spend time together in the kitchen, blending food and fun. Super Healthy Kids – Helping kids develop healthy relationships with food! Super Healthy Kids celebrates what healthy foods can do for us and how they can make us feel. Great ideas for helping children develop a mature palate, which is more accepting to a wider variety of new foods. Picky Palate – Recipes for kids with picky palates but for adults too! Lots of great family friendly recipes, providing new and exciting dishes to bring to your kitchen tables. Sign up to receive our newsletter, a roundup of our favorite posts and other great finds from around the web delivered right to your inbox! Wow! Another super comprehensive post to help picky eaters! Thank you. Awesome post Lauren! Packed full of excellent resources and ideas. I know many many families who will really appreciate this post!! Great suggestions and I’m going to look into some of those resources! Thank you for this, it will help so many parents! What a wonderful list of resources for helping picky eaters! Love all this tips. Thank You for such an amazing post. My child is also a picky eaters and I will try this tips for my kids. It will be helpful for other parents also.